As I flipped the calendar from September to October, summer abruptly turned into fall, and my inner carnivore awakened from an all summer long hibernation. I don’t know about everyone else, but as the air takes on a crisp edge and verdant foliage begins to pale, I begin to crave roasts and braises. It’s as though an oven deep within my soul has been ignited and is begging to be fed meats to brown, collagen to melt, and root vegetables to caramelize. While my imaginary oven is stoked and ready to go, the reality is that the weather has me craving roast chicken and my apartment has no oven. A little two burner propane stove is all there is in my tiny kitchen, so I had to improvise a bit to do this roast. 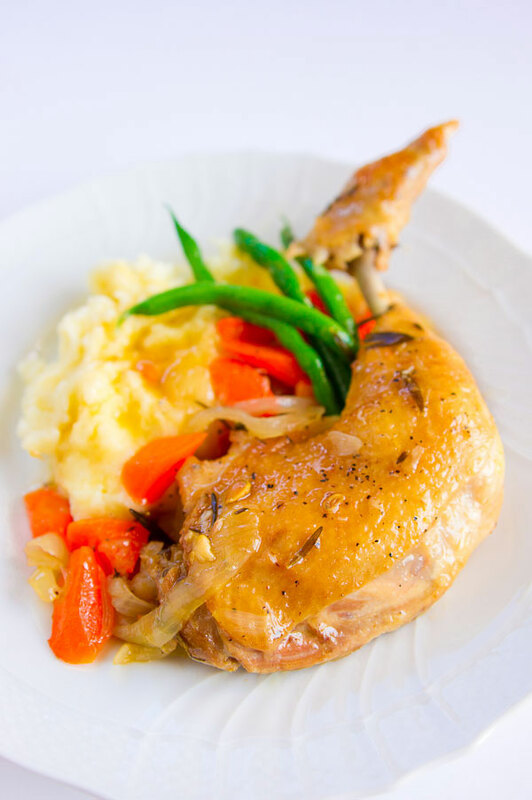 Roasting chicken in a pot on the stove won’t get you the crispy skin that an oven roasted chicken would have, but it makes up for it in two ways. The first is that the chicken is more moist and tender than you would ever be able to make it as a traditional roast. The second is that this chicken has much more flavor than you’d get in a typical roast. It’s important to use a very heavy pot (preferably enameled cast iron) when making this dish, as it will retain and circulate heat, much like and oven. It also needs to have a tight fitting lid because the only moisture in the pot will be the juices from the chicken and vegetables. 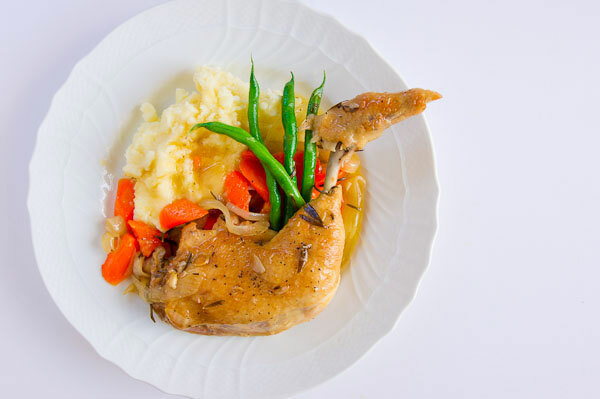 After the chicken is cooked, I reduce the remaining liquid to make a pot full of glazed vegetables and I love to drizzle the concentrated chicken drippings all over a side of mashed potatoes. 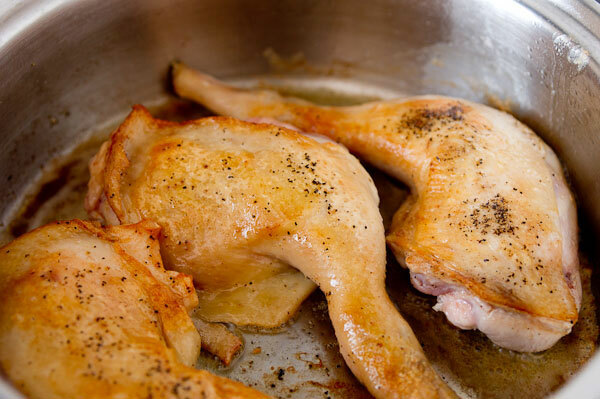 Try this alternative way to roast chicken regardless of your cooking equipment or kitchen size from Marc Matsumoto of NoRecipes. 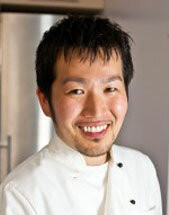 See the full post at the Fresh Tastes blog. Generously salt and pepper the chicken. Heat a large dutch oven (or other heavy bottomed pot with a lid) over medium high heat until very hot. Add the olive oil, and then add the chicken skin-side down in a single layer. If it does not all fit, split the chicken in to two batches. Let the chicken fry until the skin is golden brown, then flip and brown the other side. Transfer the chicken to a plate and repeat with any remaining chicken. Add the garlic, onion, carrots, thyme, rosemary and lemon, and toss to coat with oil. Turn down the heat to medium low, then nestle the chicken pieces back into the pot with the vegetables. Cover tightly with the lid and turn the heat down to low. 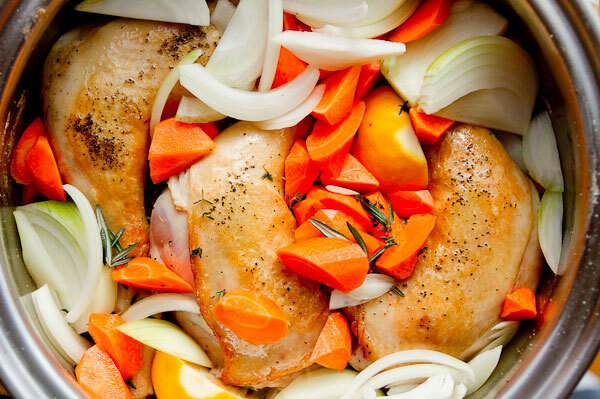 Allow the chicken to “roast” for 1 hour, checking on it periodically to make sure the vegetables don’t burn. If they are starting to burn, add a few tablespoons of water or white wine to the pot. When the chicken is cooked, transfer to a plate, then reduce the liquid in the pot until it forms a sauce that’s thick enough to pour over the chicken. Serve with the vegetables and sauce.